secret - Lake Houston Fishing! My dad raised me on crickets for bream and warmouth perch. Never tried anything else. Artificial bait was reserved for largemouth bass. But this forum now has me trying other methods. I will try those roostertails on bream. I've stated before that I know nothing about fish beyond the fact that if it has legs and/or is wearing trunks or a bikini, it's probably not a fish. Since the Panfish Lounge was started I just thought it was a place to place recipes for Pan-fried fish and I'm beginning to think I may be wrong! What are they? Same thing with Crappie - I thought it was a Perch that in the old days was considered a "crappy" fish until I heard the pronounciation, suggesting to me it's possibly something else. Are they Perch? Though many fish are referred to as perch as a common name, to be considered a true perch the fish must be of the family Percidae. 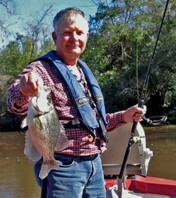 some people call crappie white perch. WTG Sticko, I just seen that you got this forum up & going! Many thanks for your responses and I have obviously got to do some Googling to understand you guys. Like most sports, unravelling the "secrets" is like breaking the tax code! I'm just trying to learn.... so no disrespect!